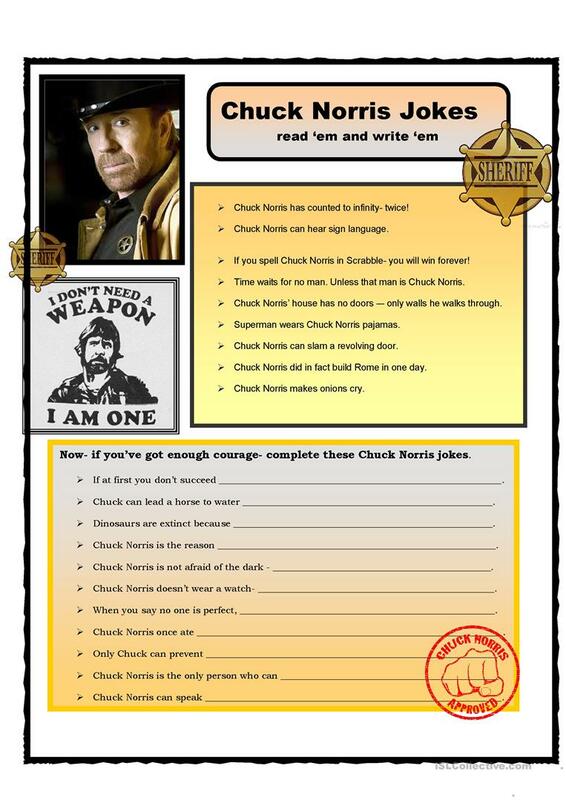 A reading and creative writing exercise based on the popularity of Chuck Norris jokes. First read and discuss the jokes. (There are entire sites on the Internet with only Chuck Norris jokes.) Then try and complete the jokes below- if you dare. The present downloadable worksheet is recommended for high school students, elementary school students and adults at Intermediate (B1) and Upper-intermediate (B2) level. It is valuable for revising Present simple tense in English, and can be used for enhancing your pupils' Writing skills. It is about the topic and words of Celebrities (stars, famous people). You will find the answers at the end of the worksheet. kifissia is from/lives in United States and has been a member of iSLCollective since 2011-10-12 07:37:58. kifissia last logged in on 2019-04-26 04:03:58, and has shared 385 resources on iSLCollective so far.